Edmund McWilliams is a retired U.S. Foreign Service Officer who served as the Political Counselor at the U.S. Embassy in Jakarta 1996-1999. He received the American Foreign Service Association’s Christian Herter Award for creative dissent by a senior foreign service official. He is a member of the West Papua Advocacy Team and a consultant with the East Timor and Indonesia Action Network (ETAN). The authors of violence in the Indonesian archipelago, especially violence with complex motives, are never so clear cut as her lecture implies. This is especially true of West Papua where police-military rivalries over access to resources and sources of extortion monies is well known. Jones’ argument warrants a more detailed critique than space here allows, but even a brief review reveals a number of problems. Jones summarily credits recent violent acts in West Papua to the “ethno-nationalists and separatists.” This is surprising insofar as Jones is a highly regarded observer of the Indonesian political scene with a deep human rights background. She knows, or should know, that the authors of violence in the Indonesian archipelago — especially violence with complex motives — are never so clear cut as her lecture implies. This is especially true of West Papua where police-military rivalries over access to resources and sources of extortion monies is well known. Jones should know also that military, police and intelligence agencies, have long played the role of provocateur, orchestrating acts of violence which advance agendas that are invariably obscure. Jones cites what she claims is recent “ethno-nationalist” pressure on the giant Freeport McMoRan mining operation. She ignores the reality that such pressure in the past has frequently been orchestrated by the military, specifically the Indonesian Special Forces (Kopassus). To be fair, Jones alludes to this complexity but largely dismisses it. Her analysis similarly ignores the reality that the Indonesian state has long blocked international monitoring of such security force skullduggery and manipulation of the security environment in West Papua by restricting travel by international journalists, human rights researchers and others to and within the region. Jones also fails to acknowledge the reality, widely noted in international and local human rights circles, that the Indonesian government has long sought to smear peaceful dissent in West Papua as “separatist.” Jakarta, through the aegis of a corrupt court system and often criminal state security forces, has repeatedly employed the “separatist” label to arrest and prosecute or detain peaceful political dissenters, such as those who display the Papuan morning star flag. Courts regularly resort to charges of treason that date to the Dutch colonial era and widely used by the Suharto dictatorship to intimidate dissidents. Jones’ call for Indonesia to define “separatism” as “terrorism” would deepen Jakarta’s targeting of peaceful dissent and the intimidation of Papuans generally. Use of the anti-terror law would enable the police to detain “separatist” suspects, including those engaging in peaceful protest, for a week rather than 48 hours. The law also empowers the police to employ electronic surveillance. Ongoing efforts would strengthen the anti-terror law to give the police even broader powers to limit the freedom of speech and assembly. The argument to employ the “terrorist” label against “ethno-nationalist and separatist” groups and individuals in West Papua could have direct legal implications for international solidarity movements. 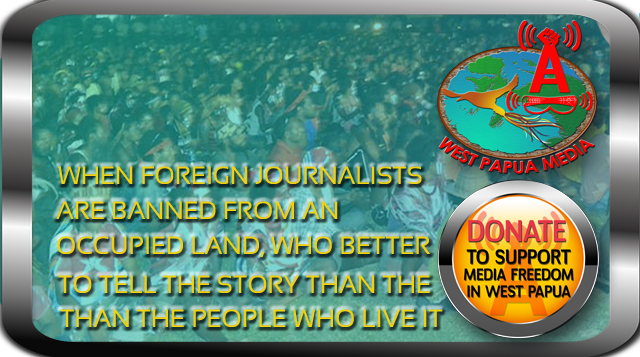 Jones claim that the West Papua Nationalist Committee (KNPB) is a “extremist,” is without substantiation. Criminal activity by some alleged members of the KNPB is generally not well corroborated and usually reflects efforts by the State to undermine the organization. The KNPB, and many other Papuan organizations and individuals are indeed ever more strongly pressing for Papuan rights, importantly including the long-denied Papuan right to self determination. But these efforts are largely nonviolent. In recent years, this struggle has found growing support within the international community. Employing the “terrorist” label against “ethno-nationalist and separatist” groups and individuals in West Papua could have direct legal implications for international solidarity movements. In the U.S., groups or individuals who advocate on behalf of groups designated by the U.S. government as “terrorists” are subject to criminal prosecution. Given the close relations among governments, including those of the U.S. and Australia and Indonesia’s security forces, Indonesian government labeling dissidents in West Papua as “terrorist” could have dire implications for the solidarity network. How long would it be before the U.S. and other governments themselves begin to label various Papuan groups and individuals as ‘”terrorist.” U.S. and other international groups acting in solidarity with Papuans seeking to attain their rights could be criminally targeted and charged. In sum, the Jones analysis is hobbled by the very term “terrorism” which is so poorly defined international law and procedure as to threaten and intimidate even those groups and individuals engaged in peaceful dissent. In a final note, Sidney Jones, who was the Asia Director for Human Rights Watch from 1989 to 2002, should at a minimum explicitly reject the call by Harits Abu Ulya that she cites in her lecture for the Indonesian government “to cleanse Papua of separatism.” Such rhetoric gives license to the kind of atrocities already visited on the people of the Indonesian archipelago, including Timor-Leste, for far too long. Papua regional police will do thorough investigation on one of the armed groups in Puncak Jaya regency, after the shootings in Kampung Kuyukwi, Puncak Jaya regency on Thursday (10/1) At approximately 17:45 EDT, resulting in injuring one of TNI member called Hasan and one civilian named H. Hadith Nito died. Papua Police Chief Inspector General of Police Tito Karnavian told to reporters in Jayapura on Friday (11/1), that measures had been taken in this and local police conducted the crime scene, and then help the victims included donors of blood for the victims who are in critical condition. “We are planning to form a team to go to Puncak Jaya. This team will conduct the crime scene and investigation, and identification of the suspects who did the shooting. The information we receive, is that actually in that area there are several armed groups, so we stayed mapping which groups are most likely to perform that action, both in terms of motives, the possible characteristics of the perpetrators, and the type of weapons used. For sure we are up for a particular group, conducting a deep research of the group, “he said. According to him, whilst a single perpetrator, but there may be people who help, supervise, and provide information, however the one who did the execution is the single culprit. “The transitory weapon had a short barrel, eyewitnesses saw a short weapon. The type is subject to forensic examination, “he said. When asked whether the shooting was by the group led by Goliath Tabuni, the provincial police chief said, all possibilities can happen, however from the temporary examination by the police this is not the group. “We see in the addition of this group there is another group in the district of Puncak Jaya. For sure we are up for the group. While as to what the motives are, we can answer the motive if the culprit is caught or someone will tell us, “he said. Meanwhile, Lt. Col. Jansen Simanjuntak of Kapendam XVII Cenderawasih as confirmed by reporters via cell phone said that military act in accordance with the rules of law applicable to the matter which the police is to investigate thoroughly. “When you look at the incident the shooter did not have any sense of humanity either at the shooting of soldiers and or civilian, fact is that the victim did not do anything wrong to be suddenly shot from behind,” he said. Previously, the shooting by unknown person (OTK) back in the villages Kuyukwi, Puncak Jaya regency on Thursday (10/1) At approximately 17:45 CET which resulted in one TNI member named PFC Hasan wounded and one civilian named H. Hadith Nito died. On September 20 2012, I, Simeon Dabi, Head of the KNPB (National Committee for West Papua), was in Jayapura and received a telephone call from Kasat Reskrim Agus Supriadi Siswanto about bombings that occurred in two places: a Traffic Police Post at Irian street, Wamena and at the Jayawijaya Province Parliament Building. I was urged to immediately come to Wamena. On the 27th of September I received another telephone call urging me to quickly come to Wamena about the bombing case there. I arrived in Wamena on Friday September 28th, 2012, and when I arrived at Wamena airport I directly headed to the Jayawijaya Traffic Police Post so that I could become a witness to the treason charges against two of my colleagues, Enos Itlay and Semi Sambom who were arrested on July 1st 2012 related to possessing an OPM (Free Papua Movement) document. Once I arrived at Jayawijaya Police District Command, I immediately met with Kasat Reskrim Agus Supriadi Siswanto in his office. I was asked many questions about the treason case against my two colleagues, then forced to become a witness for my two colleagues from 11:09-15:27 WPB. I was asked a number of questions including: “Where is the KNPB Secretariat at the moment?” to which my answer was that the KNPB does not yet have a clear secretariat; “What is the total number of KNPB members?” to which my answer was the entire Papuan society; “Does the KNPB wish to separate itself from the United Republic of Indonesia?” to which my answer was the KNPB is a medium for the people and the people will decide. After this I went home. One day later, on Saturday 29th September 2012, at 5:15pm. The Traffic Police together with Densus 88 troops carried out a sweep and ambush of the KNPB secretariat of the Baliem-Wamena Region with goals that are not clear. In my opinion, the sweep of the KNPB secretariat was done because from the time of the bombing until when I arrived in Wamena, officers had not been able to find the bombers, due to the fact that Kasat told me last time that they will give imbalah (poss. transl. money to God?) to find the bombers. Until now I am deeply surprised and do not believe that the sweep carried out by police officers found homemade bomb materials in the KNPB Baliem-Wamena Secretariat office – it is not true!! This is proof that the police were not able to find the bomber, so the KNPB were framed by the Jayawijaya Chief of Police. It is a political scenario to frame West Papuan civil society, especially people in the central highlands of West Papua. Sweeping and arbitrary arrests of civilians by the Military/Jayawijaya Police occurred in places including Kurulu district, Wosi and Kimban district on Sunday 30th September 2012, at 5:00am Papuan time. From then until now, the Military/Jayawijaya Police are carrying out pursuits and arrests of all KNPB members, even KNPB people throughout the entire Central Highlands region of West Papua, and are entering into villages. 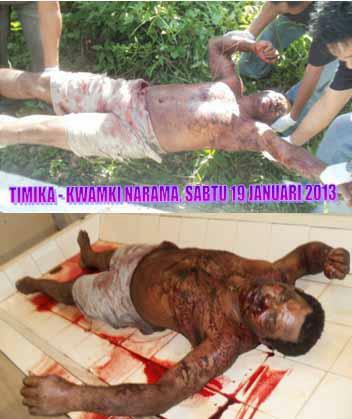 Why was I, head of KNPB Wamena, made to immediately come from Jayapura in relation to the Wamena bombing case? What is my connection to the bombings that occurred in Wamena whilst I was in Jayapura? Why upon my arrival at Wamena did Kasat of Jayawijaya Police force me to search for the bomber? After I was interrogated at Jayawijaya police, one day later Jayawijaya Police District Command carried out sweeps at the KNPB Baliem-Wamena Secretariat. How and from where did police get an explosive? Are Papuan people, particularly people of Wamena, capable of designing/creating a homemade bomb? Police officers of the Republic of Indonesia: Why does a united nation need national security? Police are security for the United Republic of Indonesia. In simple language, police are often called ‘security’. Police are often also called troublemakers in situations of national security?? Is the role and function of Indonesian Police as security or troublemaker?? Especially throughout all parts of West Papua, police are vandals of national security that always act outside the procedure/law of the United Republic of Indonesia. Simeon Dabi is currently being held in the Jayawijaya Police HQ prison in Wamena and there are grave fears for his safety, his access to legal representation, and the likelihood of a fair and impartial trial.